NEWS: Feb. 17th, St. Croix, USVI – Sir Allen Stanford, a prominent businessman on St. Croix, has just had several of his companies shut down by the federal government. The billionaire’s corporate offices in Texas were raided and three of his companies’ assets were frozen. Allegations are that he perpetrated an $8 billion dollar investment fraud. Stanford recently moved from Antiqua to St. Croix and had plans underway to build the world headquarters of Stanford Financial Group, a 105,000 square foot executive office park on 37 acres, next to the Henry E. Rohlsen Airport, our island’s major airport. Stanford owns multiple properties in and around Christiansted and a beautiful 118′ Hakvoort-built sportfisherman yacht (see yacht in St. Croix Marine story) named Sea Eagle. The captain of that yacht, whom we met a few weeks ago, may be looking for a new job along with many others on St. Croix. 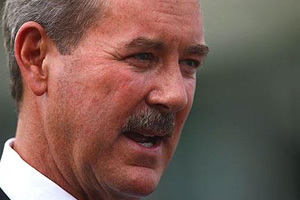 At the present time Sir Allen Stanford can not be located… perhaps he’s cruising away on his yacht? At Cruzana we usually write about “good things on St. Croix” but this is definitely not a “good thing”. Stanford Financial Group operates in one hundred thirty-six countries and six continents and is (or was) a participant of the V.I. Government’s EDC program. The economic impact of Stanford’s halted operations will be felt here on St. Croix. As of the first of February, there were 270 single family residential homes on the market on St. Croix; 9 were under contract, and 4 sold during the month. The Average Sales Price was $451,500, average days on market 248, and average % of list price 92.9%. As of the first of February, there were 205 condos on the market on St. Croix; 4 were under contract, and 3 sold during the month. Average sales price was $571,500, average days on market 335, and average % of list price 89.1%. As of the first of February, there were 507 land parcels on the market on St. Croix; 8 were under contract, and 4 sold during the month. Average sales price was $50,500, average days on market 260, and average % of list price 88.4%.